In many autocracies, regime leaders share power with a ruling party, which can help generate popular support and reduce conflict among key elites. Such ruling parties are often called dominant parties. In other regimes, leaders prefer to rule solely through some combination of charisma, patronage, and coercion, rather than sharing power with a dominant party. This book explains why dominant parties emerge in some nondemocratic regimes, but not in others. It offers a novel theory of dominant party emergence that centers on the balance of power between rulers and other elites. Specifically, I argue that dominant parties emerge when elites—regional governors, bosses, strongmen, clan leaders, chiefs, landlords, firm managers, caciques, and other such opinion leaders—hold enough independent political resources that leaders need to coopt them, but not so many autonomous resources that they themselves are unwilling to commit to the party project. By demystifying the origins of dominant party rule, this study contributes to our understanding of why some countries democratize, but others do not. In a span of just under 20 years, post-Soviet Russia has witnessed the failure of two ruling parties and the emergence of a dominant party. This makes contemporary Russia an excellent arena for exploring arguments about the formation of dominant parties. Chapter 3 shows how Russia’s ruling parties failed in the 1990s because regional elites were so strong that they would not link their political machines to any ruling party project. 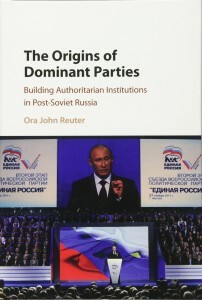 In contrast, as Chapter 4 shows, United Russia emerged as a dominant party in the 2000s under Vladimir Putin because elites were still strong enough that they needed to be coopted, but not so strong that they were prone to defect from the party. This chapter utilizes evidence gathered from over 100 elite interviews conducted during over a year of fieldwork that has been supported by grants from IREX, ACTR, Emory University, and the Department of Education’s Fulbright Hays program. Chapter 5 uses quantitative and qualitative evidence to show how, as an emergent dominant party, United Russia wins elections, coopts important elites, and manages career advancement among cadres. This chapter capitalizes on an original database of elites constructed with the help of a grant from the National Council for Eurasian and East European Research. Chapters 6 and 7 test the individual level mechanisms behind the theory. One implication of my theory is that elites who are strong in resources will be reluctant to join a dominant party. I test this hypothesis with original data on when 121 of Russia’s regional governors joined United Russia from 2003-2007. Event history models show that governors with strong political machines were less likely to join United Russia. Chapter 7 extends testing of this hypothesis to another elite group: regional legislators. During various trips to Russia, I have been collecting data on when regional legislators joined the United Russia legislative faction in their region. This chapter examines how autonomous resources affect the decisions of regional legislators to join United Russia. In particular, I argue that legislators with ties to state-dependent enterprises were more likely to join United Russia. Chapter 8 tests the macro implications of the argument cross-nationally via a large-N analysis of dominant party emergence and duration in transitional and authoritarian regimes from 1946-2006. Here I show that dominant parties only emerge and endure in those countries where neither leaders nor elites hold a preponderance of resources. When elites, especially those on the periphery, control access to regional political machines, clientelistic networks, and hard-to-tax economic assets, they may need to be coopted into a party, but if these resources give elites too much autonomy, then elites will not commit to a leader’s party project and a dominant party will not emerge. En route to testing this hypothesis, this chapter introduces a cross-national measure of regional elite strength that is based on historical patterns of political decentralization, geographic distributions of human population, and territorial concentrations of ethnic groups. The resources of leaders are measured as a function of resource rents and economic growth. Chapters 1, 2, 4, 5 and 7 are below. Please contact me directly for other chapters.